North Korean state media have raised the possibility that the isolated country could “establish a new relationship” with the United States. Meanwhile Mr Trump has said he has a “good feeling” about Tuesday’s much-anticipated summit. 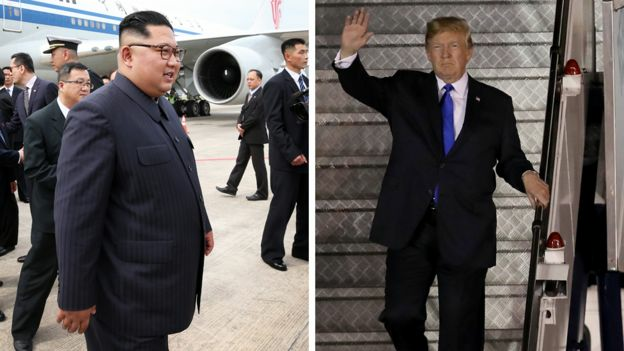 Both leaders arrived for the talks – the first ever between a sitting US president and a North Korean leader – in Singapore on Sunday. Mr Trump tweeted on Monday morning that there was “excitement in the air” ahead of the summit. He hopes the meeting will kick-start a process that eventually sees Mr Kim give up nuclear weapons. But North Korea’s perspective has always been more opaque. Later on Monday, Secretary of State Mike Pompeo said the US was willing to offer “unique” security guarantees to North Korea so the isolated state would know that denuclearisation was “not something that ends badly for them”. He stressed that the US objective of the complete, verifiable and irreversible denuclearisation of the Korean peninsula had not changed. Singapore’s Foreign Minister Vivian Balakrishnan, who met Mr Trump and Mr Kim separately on Sunday evening, told the BBC that both leaders were feeling “supremely confident” ahead of their meeting. North Korea’s state media do not usually report on the leader’s activities in real time, and the summit has only had a passing mention so far. 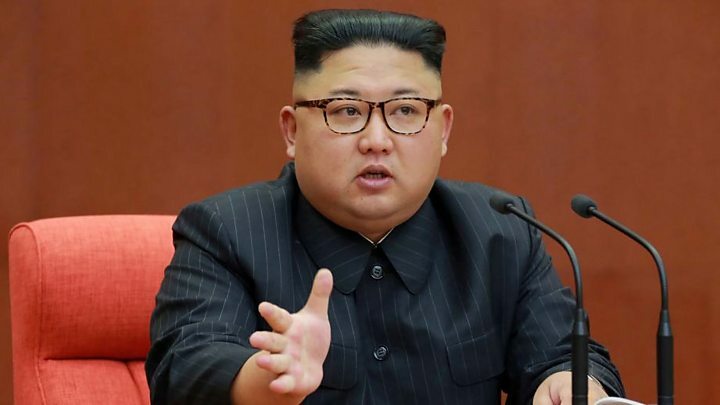 The editorial in Rodong Sinmun confirmed that Mr Kim had travelled to Singapore to meet Mr Trump and that “we will establish a new relationship to meet the changing demands of the new era”. Who are Kim’s running bodyguards? It said “broad and in-depth opinions” would be exchanged to “establish a permanent and peaceful regime in the Korean peninsula and to solve problems that are of common concern, including issues to realise the denuclearisation of the Korean peninsula”. “Even if a country had a hostile relationship with us in the past, our attitude is that if this nation respects our autonomy… we shall seek normalisation through dialogue,” it reads. For decades the US has been a sworn enemy. There are even anti-American museums in Pyongyang. But the state is now trying to sell the idea of talking to what it once described as “the incarnation of all sorts of evil, the empire of devils”. And that was some of its milder language. So let’s examine a couple of key phrases from Rodong Sinmun. In the English version, the summit is sold as a chance to realise “the denuclearization of the Korean peninsula and other issues of mutual concern, as required by the changed era”. It’s the “changed era” that is important. North Korea has spent decades building up a nuclear arsenal at great personal cost. Kim Jong-un needs to tell his people why he’s willing to negotiate. His New Year speech – the one that kick-started this diplomatic process – was all about North Korea’s strategy of building the economy having achieved the goal of becoming a nuclear power. This has echoes of that. These pages in the paper are significant because they pave the way for a possible change in the state’s message and it helps those watching argue that this time with North Korea – things could be different. Preparation for the unprecedented summit has been both frenzied and unusual. A meeting of this kind is usually reserved as the end result of months of discussions and diplomacy. Few details of the agenda have been released and they continue to be fleshed out on the eve of the summit. Mr Pompeo said that senior officials from both countries were meeting in Singapore on Monday and those talks “were moving quite rapidly”. 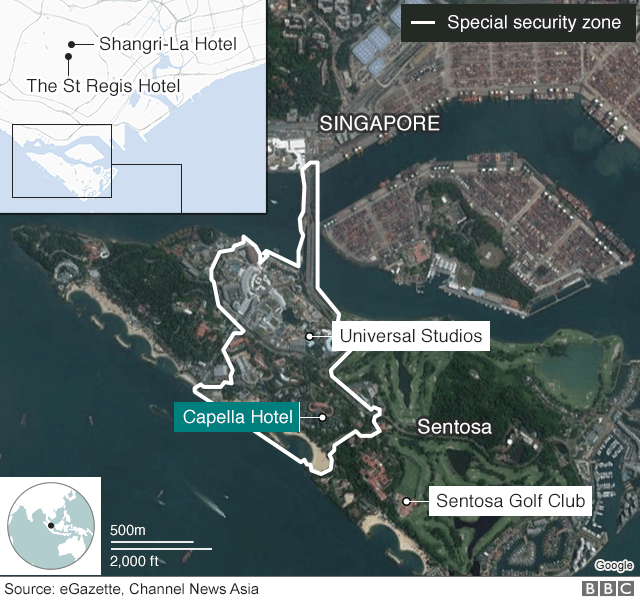 The US president and North Korean leader are staying in separate hotels, not far from each other, and will meet on Tuesday at a hotel on Sentosa, a popular tourist island a few hundred metres off the main island of Singapore. Mr Balakrishnan confirmed that Singapore was paying for the North Korean delegation’s stay, describing it as “hospitality that we would have offered”. The two leaders have had an extraordinary up-and-down relationship over the past 18 months. Mr Trump’s first year in office was marked by bitter exchanges between himself and Mr Kim – as North Korea conducted several ballistic missile tests in defiance of the international community. The US president successfully sought to tighten UN sanctions on the North, and to get its traditional ally, China, to go along. He also famously vowed to unleash “fire and fury” if Pyongyang kept threatening the US. 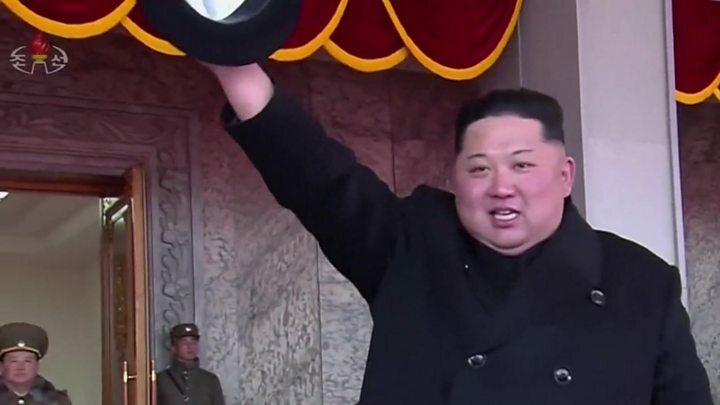 Mr Kim has called him “mentally deranged” and a “dotard”. A defiant North Korea carried out its sixth nuclear test in September 2017. Soon after, Mr Kim declared that his country had achieved its mission of becoming a nuclear state, with missiles that could reach the US. In early 2018, a remarkable turnaround in the relationship occurred. It started with significant diplomatic overtures from North Korea towards South Korea during the Winter Olympics. In March, Mr Trump shocked the world by accepting an invitation from Mr. Kim to meet in person. Denuclearization has been the central issue in the run-up to the talks. The US wants North Korea to give up its nuclear weapons, but North Korea is widely expected to resist that and it is unclear what it might ask for in return. Who’s pulling the strings of the North Korean breakthrough? Nixon in China: Lessons for North Korea? Mr Kim has also said he wants to focus on building the North Korean economy – and thus wants sanctions relief and international investment. The question is what concessions he is willing to make, and whether he will stick to any promises made. Still, the US is not necessarily expecting to get a final deal in Singapore. President Trump has described it as a “get-to-know-you situation” and said “it’s going to be a process”.